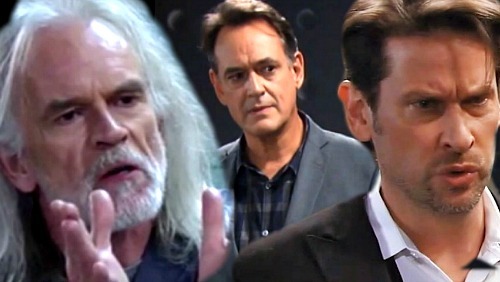 General Hospital (GH) spoilers reveal that Kevin (Jon Lindstrom) could have a shocking hidden agenda. Something seems to be up with him right now. He’s been exhibiting some bizarre behavior ever since he started this psychopath study. When Kevin scored the brain that’s supposedly Faison’s (Anders Hove) for his research, he certainly gave off a creepy vibe. There have been some puzzling moments in Kevin and Franco’s sessions, too. Kevin usually seems to frustrate Franco more than anything and maybe that’s the goal. General Hospital offered some other interesting clues when Kevin was summoned to speak with Betsy (Deborah Strang). Their chat left many GH fans wondering if there’s more to the story. Kevin knows how much Franco wants to get to the bottom of what happened in his childhood. It’s all Franco’s been talking about for months! Betsy was finally back in the picture and ready to spill all. It wouldn’t have taken longer than a minute or two for her to blurt out the truth. Why not just let Betsy get this off her chest? It would help her feel better, right? However, Kevin suggested that Betsy needed to work on herself first and argued that Franco shouldn’t be around when she was transported to GH. Later, Kevin urged Franco to see Betsy, but only after she was sedated. Hmm…all of this seems awfully suspicious. It almost feels like Kevin is trying to keep Franco from learning the truth about his past. If that’s the case, what could Kevin’s goal be? Perhaps this psychopath study is more about preying on dangerous desires. Maybe Kevin secretly wants to exploit Franco’s dark side and use it for nefarious activities. Why would Kevin want to do that? It’s possible that Kevin isn’t quite himself these days. Kevin may be the latest memory-mapping victim. If his evil twin is still alive, he could’ve easily been swapped with him and given Kevin’s memories. Ryan’s true colors might finally be shining through anyway. Then again, Kevin may have been given Ryan’s memories. It wouldn’t have been too hard for him to learn how to keep playing the part of Kevin. If the switch happened lately, that’s even better. Without Laura (Genie Francis) around, it’d be a breeze to keep up the act. Regardless, this could all tie back to Faison. Kevin may be continuing the work of his potential boss. Since Drew (Billy Miller) and Jason (Steve Burton) are no longer useful, Kevin could be trying his luck with a convenient subject. If he can bring out Franco’s wicked side, Kevin could have a valuable tool to wreak havoc. General Hospital spoilers say Kevin will suggest hypnotherapy next week. It sounds like Betsy may clam up entirely, which is what Kevin may want. This would give him an opportunity to brainwash Franco with some false memories. Kevin could make him believe he was rotten from the start and keep this storyline going. Do you think Kevin’s up to no good? Is he hurting Franco instead of helping? Some big twists are looming, so we’ll give you updates as other GH news comes in. Stay tuned to the ABC soap and don’t forget to check CDL often for the latest General Hospital spoilers, updates and news.